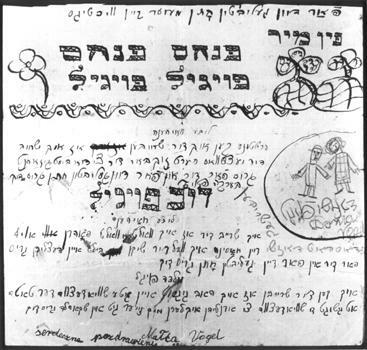 Holocaust Survivors: Photo Gallery - "Children's Letter"
Eva Galler's aunt Helen moved to Israel and married uncle Joseph. The children in the Galler's household sent greetings to the betrothed, and this letter was recovered after the war. Yiddish is written in Hebrew characters and reads from right to left: From me, Pinchas Vogel. Dear Helen, What is going on? Are you healthy? Regards, Berele. I would fly to your wedding. I will send you a photo. Regards to you and your husband, Malka. I had a very good report card. I am doing well in school. Malka. The drawing of the man and woman is by Devorah.